« The Worst Cookbook Interview Ever? GetUp have pulled out all stops and produced their most convincing science and economics advert to wow “the nation’s decision makers” (they actually use that phrase). Don’t hold your breath waiting for the cost-benefit analysis though — the closest they get to science is a picture of a chimp. The jokes though, could go over well with the under-ten-set. If this the progressive movement maturing, I can only say congratulations to them, they’ve made double digits. The reasons to eschew our cheapest form of energy, to pay even more tax to not-build-more-hospitals-schools-and-roads (and not do more medical and physics research) is so obvious, apparently, that any brainwashed 13 year old can see it. It’s all to do with piggy banks and caricatures of what the business world is like. Get it? As you watch it, ponder that someone in GetUp either thinks this will impress “decision makers”, or else cynically thinks the people who donate to GetUp are stupid enough to believe that. “Our team of media buyers are searching for availabilities in the programs that we know decision makers watch“. As if our Senators and M.P.’s have time to watch TV… Strike that – they will be watching Bolt on Sunday. 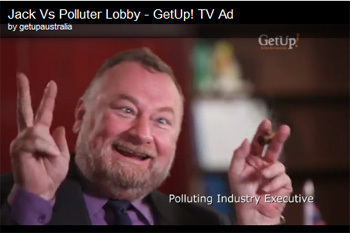 Just let GetUp run the ad then please! When they can’t think of a good reason to take your money, they smear and slur instead. This is just gutter talk and a clumsy hate campaign. The cheap joke with the monkey is really going to win over the people who prefer Abbott to Gillard in polls eh? There’s also the banal undercurrent of class warfare, and of jealousy: the GetUp team are feeding those who didn’t make it up the ladder of economic success with crass excuses to hate those who did. The so-called polluters are the law abiding bedrock of essential services. (If they had broken a law, they would be charged wouldn’t they?) Coal executives aren’t angels, but turn off the coal power stations for a week and see what happens to the country. GetUp still deceptively claim that they don’t support any particular party and “receive no money from any political party or the government.” No No! “We rely solely on funds and in-kind donations from the Australian public.” Yet they were caught hiding the $1.2 million donation from the CFMEU during the election campaign, which makes them a form of disguised Labor Party activist group. At the same time that they took money silently from the CFMEU, they supported a ban on political donations from unions and business. As for the CFMEU, it supposedly serves mining employees. As the Union says “We build the mines and power plants that fuel our economy and the ports that handle our trade”. So where is the CFMEU protest to GetUp at the denigration of the mining industry for being uncaring profit-hungry chain-smoking polluters and at the crazy economic plans that will put thousands of their own workers out of work? Psst Miners? Where are you? Your union seems to be working to put you out of a job and raise your electricity bills, petrol bills, and food costs. Why be a serf to the self-anointed elites whose great hope for you is that you’ll have less holidays, less heating, fewer trips in the car or by plane, and less choice at the supermarket? The Carbon Tax is not about shifting money from “big polluters” to you. That’s the big lie. It’s about taking money from all of us (through higher costs) and feeding the jobs-and-junket market for the anointed green police who want to tell us how to live, while they pork barrel and hand-out trinkets to their pet mascots and patrons. GetUp is the low base arm of the Nanny-State, come to tell you how to live. This is a really stupid ad. If we needed any evidence that GetUp is funded by left wing politics then here it is. As usual, no facts presented. BTW, all those who think the Government compensation will make up for this oppressive new tax, what will make up for the lower economic activity, exports, lost jobs, lower superannuation returns, and lower corporate tax revenues for the government! This is a really stupid ad. Actually, and with all due respect, it is not. It is what is known in propaganda theory as a “penetration ad”. They are usually used at the beginning of attack campaigns, to get people talking about a particular idea, or issue or event. It doesn’t matter how bad the ad is (in fact the worse the better), but people have to notice, and have to be laughing at how stupid it is. Once the authors have people’s attention, they then follow up with the “grand reveal” , which is designed to shift the focus onto the real target (in this case, it may well be Tony Abbot). The thoughts of how stupid the original ad was, also get transferred to the new ad, and hence the real target. The third phase is a series of ads that pile on the sound bites, that can be attributed to the real target, and use all of the photographs (whether photoshopped or not) that help to make the case. Since the original ad shows the chimp multiple times, I suspect they will try to depict the real target as being similar (it has been done in respect to other eminent persons with obvious ears). This is left-wing propaganda at its worst. The following relates to the last post as well as this one. It covers the real issues in the USA related to energy and “green” technology. Comparing consumption and production in the US to Australia, I find it very difficult to understand how anyone in Australia can possibly believe it makes sense to tax the stuffing out of everything that moves with ZERO benefit to all concerned. The full implication the name GetUp has just hit me. It’s a subconscious call for a rocket up the kollective khyber. GetUp has firmed in the running for propagandist of the year, and is Up there with 10:10 Campaign’s No Pressure clip for having the reverse effect for which it was intended. They even have the audacity to ask viewers to donate so they can air it. One wonders about the age and maturity of the GetUp team….. Interesting to see that the Australian Coal Association is approaching advertisers… expect another mining tax war of ads IMHO. They won’t sit idly by and watch the Rainbow Coalition flush billions of dollars of assets down the gurgler. Get Up! eh ………sounds like the frustrared cry of an angry feminist. Darn, I can’t get their online donation system to accept a negative donation. If this proves to be true all our troubles are over. But is it true or just more BS, who knows? We’ll have to wait until October this year. LOL .. thanks for promoting the video!! I work in mining related construction currently (and have spent a number of years on mine sites). I had a conversation with one of the blue collars (yes they still use in the construction industry, blue and white collars to define the types of roles). We were talking about the tax, the cover up of the debate, and how it will affect everyone. Bear in mind, the cleaners here are on $150,000 a year, the T/A’s are also on $150k, and the tradesmen start at $180,000 (a lot of the white collar workforce start at a third of those salaries). Trying to explain hyper-inflation and sudden cost of living increases is impossible with that mentality. She’ll be right, the unions will sort it out… WTF??? so much money for GetUp, but who pays the SBS chairman? Mr Skrzynski was appointed to the SBS Board for five years as a non-executive Director on 27 March 2009, one of the first appointments made under the Rudd Government’s merit-based process announced on 16 October 2008.
what chance SBS reporting the facts about CAGW? BTW if you want to join in the ‘debate’ (or rather one side insulting the other for using facts and science to prove logical points) visit the Say Yes Australia Face Book page. Its very easy to get them to show their true colours; so enjoy. Also the donation system seems a bit suss to me, the rate of donations seemed rather too ‘regular’ for me. Interesting to see Big Coal getting concerned. Some time ago when the debate was more concerned with the science I urged various players in the Big Coal arena to use the scientific expertise of their employees or consultants to test the Gore/IPCC argument. No reply. They didn’t want to make the mental effort to get to the facts? Believed they could get their lawyers to talk their way out of the problem? Instead of moaning about the tax they should attack the real problem…the lack of testable/factual scientific evidence! I suspect the cost of a physics based analysis of the role of CO2 in climate change will be a fraction of the cost of what Big Coal will spend on advertising.That will be just what their shareholders want?? Even the malignant greens have seen through this and by avoiding the issue the coal industry has not been able to refer to its great benefits: the cheapest source of energy upon whose back Western civilization has developed and, given, the advances in generator technology in China which is building more new generators, an energy source which is still the yardstick. If we for a minute assume that everything the IPCC says is true (obviously it isn’t, but let’s play pretend). Even if we assumed that the world was going to end in 20 years unless we reduced emissions, why on Earth would we be talking about an ETS to prevent it when we know they don’t work? If this was a really serious thing that the pollies actually believed in, that was really going to cause us damage in 20 years, we’d be building nukes and researching methods for making coal stations run clean immediately. It would be an effort similar to the Manhattan project or the space race, regardless of whether the voters thought it was a good idea or believed in climate change, we’d be put on a war footing and economics suspended to get this fixed. But we’re not, and the ‘solution’ they’re proposing is taxing people more and then they get all vague about how that tax will be used to actually stop CO2 getting into the atmosphere. It’s not a real crisis, you’ve drunk the kool-aid and believed the propaganda. No-one who is in a position to do anything about this actually believes in it, or they’d be behaving differently. They’re using it to further their own ends, and it’s got nothing to do with the climate. Watch the money. If it was a real crisis the money would be being pumped into research and engineering to solve the actual problem. Instead the money’s going to ‘raising awareness’ and propaganda efforts, incredibly inefficient domestic solar rebates, Gaia-friendly causes and ‘think tanks’. Not a single actual real effort to get anything done about the ‘problem’ because the aim is not to change the climate but to change public opinion. Luckily, the temperature is evening out, and the climate changes all the time for perfectly natural reasons, the feedbacks are mostly negative, and the whole system is much more stable than any ‘climate scientist’ gives it credit for. So if we could just stop panicking and get on with bringing the rest of the world up to a decent standard of living so they’ll stop breeding so much, that’d be great, thanks. … thanks for promoting the video!! All hits are belong to us! I wonder, can I donate 1 cent to their campaign and have processing fees cost them more money than I gave? “In the 1950s scientists theoretically showed that if the lower atmosphere (troposhere) was trapping more heat from man’s CO2 emissions then less heat would be escaping to space and hence the upper atmosphere (stratosphere) would be cooling. This has now been confirmed by satellite measurement. If the warming we are seeing was caused by the sun then the temperature distribution would be more even – you would not be seeing the stratosphere cooling. It sounds very fishy to me: cooling is proof of warming, but where is this guy coming from? Where is he getting his “information”? The ‘nice’ thing about propaganda, is that it doesn’t have a “best before” date label. So a message, once it gets released, can circulate forever, going feral, and breeding indiscriminately. Messages like this are only given credence by the sort of person who believes what they are first told, and then actively resists any attempt to modify that belief. Sadly, that is a large proportion of the population. It is a straw dog argument which devalues what should be seriously debated, a misappropriation of funds on an enormous scale. Murray – see my response to John Cook and skeptical science. The fingerprint of a cooler strat and a warmer trop doesn’t tell use much. It could be CO2 growing, but falling ozone also cools the trop stratosphere (Sorry – typo). In any case this fingerprint only relates to direct CO2 warming, not to the amplification which only comes from water vapor and should show up 10km above the tropics at the boundary between wet and dry air. ie. it tells us maybe 1 degree of warming is coming. The lack of a hot spot rules out anything bigger. Good to see the Get Up ‘youth movement’ in action. Now, let me think, who else was it that had a ‘youth movement’?. Gov. Chris Christie said Thursday that New Jersey would become the first state to withdraw from a 10-state trading system, (the Regional Greenhouse Gas Initiative), declaring it an ineffective way to reduce carbon dioxide emissions. One down Nine to go – New Hampshire next. The video is customarily pathetic, I was relieved to see how bad it was. It will have a cost a bit of money and they will have high hopes for it’s effectiveness of course. It won’t get hounded out of reality like the exploding kids did but it is an embarrassment none the less to anyone associated with it. Insulated in leftist groupthink as usual – you would have to be to think that would work. Another miscalculation. Jo @28 I think you mean falling ozone cools the stratosphere? Fear and ignorance are the true source of superstition. They lead a blind and terrified public to embrace any practice, however absurd or frivolous, which either folly or knavery recommends. Mike, #28 thanks. Of course. I’ll fix that. MurrayA @ 24, I recommend reading the follow up reply that addresses Nova’s reply. Oh and for those that are honestly interested in the science, this research has some good insight too. You took the words right out of my brain! Well written. These kind of stupid ads have to be respected for what they are doing, not denigrated because intelligent people think they are stupid (after all, most people do not think – they feel). You continue to amuse us all by quoting Lies and Propaganda from this GAIA CULT website the NON “skeptical ‘science’”. You are indeed and Ignoramus ! But the hopelessness of the Greens is in their own minds. Building on almost 20 years of research, in January this year, fusion-watchers were shocked and skeptical when two Italian scientists Andrea Rossi and Sergio Focardi demonstrated a small nuclear device in front of a number of independent physicists, producing abundant heat, with little or no radiation or waste, and no carbon dioxide. They promise to be operating a 1MW power-plant by October 2011 at an estimated cost of $10 per MWh; 10 times cheaper than conventional power, nuclear, and 20 times cheaper than renewable energy sources. Of course, it sounds like one of these energy scams and many have said it’s “too good to be true”. But a number of successful verifications have followed, including with the skeptic society of Sweden. Now, Rossi has signed a contract with a large firm with a history of contracting to the US Department of Energy. According to Rossi’s patent, his Energy Catalyzer (ECat) consists of a heated tube of powdered nickel (Ni) and proprietary catalysts, through which hydrogen (H) is pumped at high pressure, surrounded by boron and lead shielding, and encased in a water jacket. Rossi claims the power results from conversion of nickel to copper and other lighter elements. Full conversion of 58g of nickel would produce the energy equivalent of burning 30,000 tons of oil. The radiation emitted during operation of ECat was barely detectable above background. Transmutation of elements would leave little doubt of the nuclear origins. Understanding all the details of the reaction may not be far off, as NASA has initiated a project to study the reaction, and the smart money is on a Low Energy Nuclear Reaction (LENR) called the Widom-Larsen reaction, involving the weak nuclear force, absorption of naked H atoms into the Ni lattice atoms and subsequent low-energy beta-decay processes. Ironically, Rossi’s developed his devices without the assistance of government programs or grants, and in the face of the opposition from the establishment academics, who have seen Ni-H reactions in the same light as ‘cold fusion’. But this is how great leaps are made, with imagination, persistence, and occasional flashes of success. The same problems faced in the development of semiconductors, now a trillion dollar industry that has changed our lives. Fortunately, if Rossi’s device is genuine and scales up, as appears to be the case, it no longer matters what the Greens say or do, and whether government or academia supports this or not. Due to the low cost, transition to a zero-emission super-abundant energy future will be inevitable. The entire raison d’être for renewable energy will be history. Emphasis added. Really liked the first and last sentences! The future of atomic energy, however, does not depend upon whether or not this new idea is scalable or not as there are equally safe and reliable systems already producing electricity and that produce no waste which could be brought into production without taking decades to build. (Amber golden light flickers on the face of Gorp, bundled in a robe made of baby Harp Seal skins, now widely available since other forms of economic activity have ceased and people have little more to do than bash animals over the head for nutritional and clothing purposes). Gorp: So tell me Mann-san (the future seems to have a creepy Japonaise feel to it a la Bladerunner) more about the Precautionary Principle. Mann: (close-up of a chubby face peering out of a snorkel hooded jacket made of Polar bear fur) Well, the idea was to absolutely destroy all economic activity that is not sustainable so as not to destroy the planet. (He evinces a bright “school boy” look, smiling at Gorp, a look spoiled by the spider web cracks in his glasses, unrepairable since lens making is not a sustainable activity, the Ministry of Glass having determined that there is insufficient recycling of Silicon products to justify lens production. Plenty of broken glass but no way to tote it around). Gorp: Destroying economic activity. Brilliant! Perfect for a guy like me. (Picking up his bloody and brain splattered club, feeling the weight of it in his fingers. Talent: Improvise! Gorp shows us that he and his club now rule the Nattering Nabobs-the name of the tribe, and anybody else with the misfortune to be around him). Gorp: “Do you know that I can kill, skin, and clean a rabbit in about ninety seconds. My record was 81 seconds back when we had clocks, and I really think I have beaten that record since, but since I think it is unethical to splice the clock record with the new drum/hourglass method I cannot be sure. AND THAT PISSES ME OFF! Mann:I don’t think splicing is a problem! (Hopefully) Besides, who says rabbits aren’t sustainable? Mann: “Look, OK, mistakes may have been made, honest mistakes. For instance, the whole Sustainable National Defense Protocol concept, maybe a little ahead of its time.” (Looking feelingly at Gorp’s club). Mann: Not that there’s any thing wrong with clubs! In the right hands a weapon for change is a weapon for good! Gorp: What I like about you, Dr. Mann, you…(trying to thing of one thing). Mann: (Sensing an opening). Gorp. Um, Mr. Gorp. (not there yet) Dr. Gorp, alright. Who’s the doctor here? Come on! Dr. Gorp, Gorp, Gorp, Gorp! (Crying out to the crowd, well, the five or so cave men gathered around the fire). Can I get somebody to testify! (playing the religion card). Gorp: OK, OK, OK. Calm yourself. OK? ( Dr. Mann, quiet as a mouse). (Gorp contemplating for a moment, does he really want to say this… With a touch of vulnerability…) I think I might actually be a god. OK, there I said it! Mann: You know…I didn’t want to say it but, Wow! There is a glow about you! Until you said that…CLUELESS!!! (hopeful, spinning his fingers about his temples to represent his cluelessness). Heh. You Sir are a Playwright. Can you get funding to produce the video? I certainly liked it and have cited it. 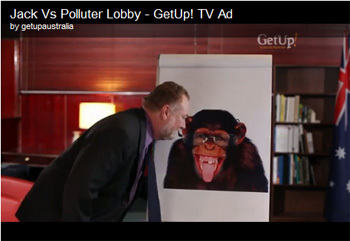 Not just GetUp that hasn’t a clue, check out the Cate Caton ad, it’s hilarious, they included a UK Power Station that closed 30 years ago. Cate Blanchett and husband Andrew Upton’ Sydney Theatre Company received over $4.5 million of taxpayer money for calendar 2010. Perhaps she should arrange for it to be repaid because she now has a moral conflict of interest. He remind me more of a Union Czar, than any Industrialist, that character the Get Up Video is putting up as a strawman.